Craig G. Bartholomew and Ryan P. O’Dowd provide an informed introduction to the Old Testament wisdom books Proverbs, Ecclesiastes and Job in their new book, Old Testament Wisdom Literature: A Theological Introduction. Establishing the books in the context of ancient Near Eastern wisdom traditions and literature, the authors move beyond the scope of typical introductions to discuss the theological and hermeneutical implications of this literature. 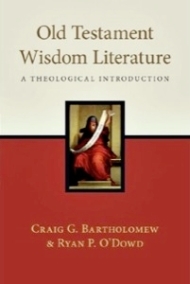 About the Author(s):Craig G. Bartholomew (PhD, Bristol University) is the H. Evan Runner Professor of Philosophy and professor of religion and theology at Redeemer University College in Ancaster, Ontario. He is also a visiting professor in Scripture and hermeneutics at Chester University College in the UK. Goheen and Bartholomew are coauthors of The Drama of Scripture. Ryan P. O’Dowd (Ph.D., University of Liverpool) currently serves as associate professor of Old Testament at Briercrest College, Saskatchewan, Canada. His teaching experience includes theology courses in Hebrew, introduction to and philosophical hermeneutics, and social justice as well as teaching flight classes as an air force officer. O’Dowd has published articles in scholarly journals such as the European Journal of Theology and texts including The Canon and Interpretation (Zondervan) and The Bible and Epistemology(Paternoster).